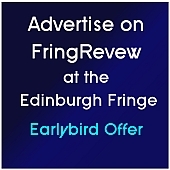 Judith Amsenga and Jules Munns talk about The Nursery, the dedicated performance space for improvised theatre, comedy and cabaret at the Edinburgh Fringe. You could spend a whole day at the Thistle Hotel with shows like these. This entry was posted on Wednesday, August 12th, 2015 at 7:58 pm and is filed under Audio Interviews, Edinburgh Fringe 2015. You can follow any responses to this entry through the RSS 2.0 feed. Both comments and pings are currently closed.